The Rev. James R. Berger, has been an active American Baptist pastor here in ABCNJ and several other Regions within the denomination. We were saddened to receive the news of his sudden passing on Sunday and express our deepest sympathy to the family, members of Cape Island Baptist Church and the many friends. Just this passed Wednesday, Pastor Berger attended the WNJBA Pastor's Luncheon and shared his excitement about the coming Holy Week and Easter Services. His attendance demonstrated what his life professed--the Gospel of Jesus Christ including the assurance of resurrection. 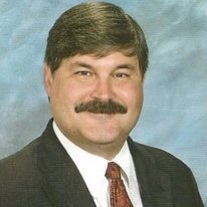 BERGER, Pastor James R. – 52 of Cape May passed away suddenly and peacefully at his home on Sunday morning, March 17, 2013. Pastor Berger had been a resident of Cape May since 2003 when he became pastor of Cape Island Baptist Church. He has served as a pastor since 1992 after receiving his Masters of Divinity from Eastern Baptist Theological Seminary. He was raised in Hughesville, PA where he met his wife, Sarah. Pastor Berger will be forever remembered for his passion in serving God and His community. He was an avid book lover and a great friend to many. He is predeceased by his mother, Eileen Mae (nee Berger). Pastor Jim will be dearly missed by his loving family which includes his wife of 26 years, Sarah; two daughters, Katherine Berger and Dorothy Berger; father, Robert E. Berger; sister, Victoria (and Conrad) Mailleue; brother, William (and Leslie) Berger; also his nieces and nephews. The memorial service and celebration of the resurrection of Pastor Berger will be held on Saturday (March 30th) at 11AM in Cape Island Baptist Church, 115 Gurney St., Cape May where friends will be received from 9:30AM until 10:50AM. Interment will be private and at a later date. In lieu of flowers, memorial contributions are suggested and checks payable to: Berger Children’s Fund (for the education of his daughters), c/o Sturdy Savings Bank, PO Box 2355, Cape May, NJ 08204-2355. There is additional information found on the funeral home's website.